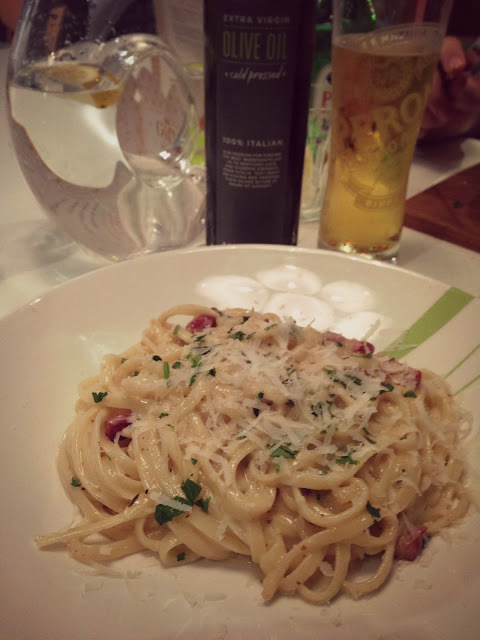 This is something a little different from me today but hey, a blog is for talking about things you like...and I just LOVE Italian! Living near Bath, I spend a lot of time wondering around and finding new places to go. But for some reason I always find myself coming back to Ask Italian, and the Vouchercloud discount codes are not the only reason (although they do help...hey I am a student after all!). So when it comes to date night with Sean, you can normally find us at Ask. Ask is located in George Street which runs parallel to Milsom street (for all you shoppers out there it's the street that House of Fraser is on!). It's quite a walk from the bus station, especially in heels, so make sure if you're taking the bus, get off as close as you can! There is a pay and display car park down a small alleyway next to it but, like all parking in Bath, can be pricey. 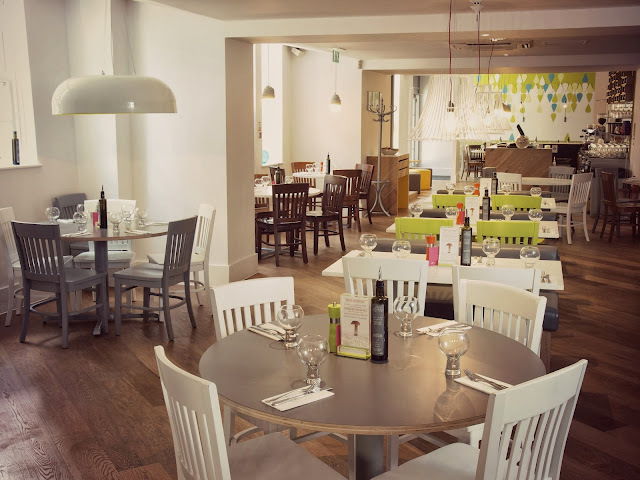 That being said, it is in an ideal location if you are looking for somewhere to take a well deserved lunch break from shopping or is perfectly located if you want to hit the town after an evening meal. I wouldn't say that the inside is decorated like a typical Italian. It's actually quite modern with lots of bright colours and modern lamps like in the picture below (how much do you want this in your house?!). The restaurant is split into 3 sections which sometimes aren't all open depending on the day of the week. Typically midweek only one section is open and on the weekend they are all open. The toilets are a bit of a pain to get to because they are underground, meaning you have to navigate a million stairs. But if you can get past that Ask has a nice atmosphere and lighting which gives a nice mood. 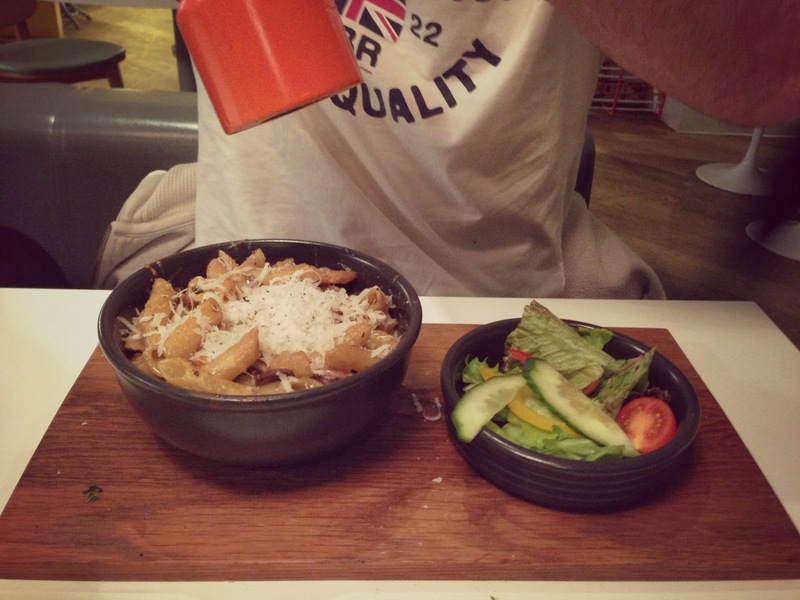 I'm actually quite boring when it comes to food as I'm one of those annoying fussy eaters. My go-to meals at Ask are the Carbonara or the Stromboni Pizza (thats pepperoni to me and you). They have a wide range of pastas, pizzas, risottos, salads and a specials board which changes weekly (which Sean has a habit of picking from...) so you are bound to find something you like. 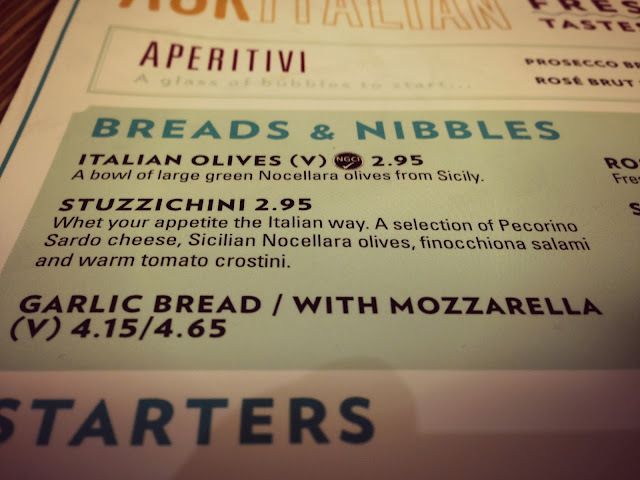 Me and Sean always get the garlic bread with mozzarella to start and fight over it till the last bite, but if thats not your things there lots of other options from bruschettas to calamari. My personal favourite part of the meal though is the dessert and how I choose between chocolate cake and cheesecake I'll never know. But both are viable options and highly recommended! I can honestly say I have never had bad service in Ask before. Occasionally food has taken a little while to come out (note to self, new years eve is a busy time! ), but no restaurant is perfect and during busy times it is inevitable. The staff are friendly and polite, they take care of you for the duration of your meal and are always there if you need anything. For the price you pay for your meal (especially with a voucher code), I don't think you can go wrong! I definitely rate Ask highly, and if given the choice to go to Ask or the ever so popular Jamies Italian round the corner, Ask wins hands down. I think it's the atmosphere for me, knowing your going to get good quality food, friendly service at affordable price. What more could you ask for? 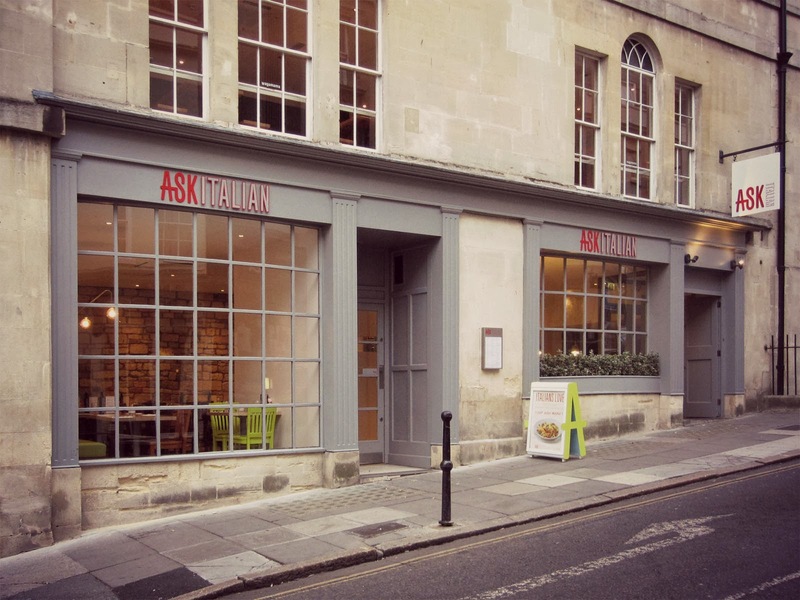 Have you ever been to Ask Italian in Bath? The food looks amazing :) and I think the decor looks really nice ! !